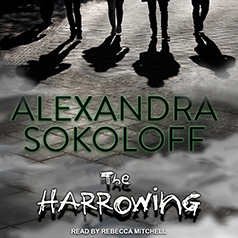 Alexandra Sokoloff presents The Harrowing, which was nominated for the Bram Stoker and Anthony Award for Best First Novel. The five unlikely companions establish a tentative rapport, but they soon become aware of a sixth presence disturbing the ominous silence that pervades the building. Are they the victims of a simple college prank taken way too far, or is the unusual energy evidence of something genuine—and intent on using the five students for its own terrifying ends? It's only Thursday afternoon, and they have three long days and dark nights before the rest of the world returns to find out what's become of them. But for now it's just the darkness keeping company with five students nobody wants and no one will miss.